The ancient site of Olympos dates back to Hellenistic times when it was an important Lycian city and became famous as a place of worship honouring Hephaestos or Vulcan, the God of Fire. Located on a beautiful sandy bay, the ruins are spread out on either side of the Ulupinar River and include a Byzantine bathhouse with mosaic floors, a marble temple entrance, a theatre, and some excavated tombs. The shoreline is also a major protected nesting site for sea turtles. On the rocky slopes above the ancient city are a series of eternal flames issuing from cracks in the rock, caused by the combustion of natural gas seeping out of the mountain. It is possible to extinguish them briefly, but they will always re-ignite and are most impressive in the dark when at their most visible. The fire that comes out of the ground is said to be coming from the mouth of Chimaera, a mythical fire-breathing monster with the head of a lion, the body of a goat, and a snake's tail, who was slain by the Lydian hero, Bellerophon on his winged horse, Pegasus. Transport: The bus from Antalya to Olympos takes 1.5 hours. 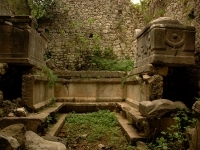 In season minibuses travel to Çirali: from here the eternal flames are less than a mile's (1.5km) walk away.